This is the first real use that I came up with for the EMX board and it would appear that many people have questions regarding the SD card reader capability of the EMX. An SD card would be a quick and easy way to increase the available memory for this primarily embedded system. You might need to save or read text files or log your application to help debug it, updating your application in the field, or other uses. The first field sets up a PersistentStorage object for out SD card. The second line sets up a port to provide us an interrupt when the SD card is insert and removed. In this case we are going to use IO36, with a glitch filter, using a pull up resistor on the input and finally we want a notification for high and low transitions. If you look closely at the development board, there is a double row of headers down near the lower left side of the board with one side labeled JP1. 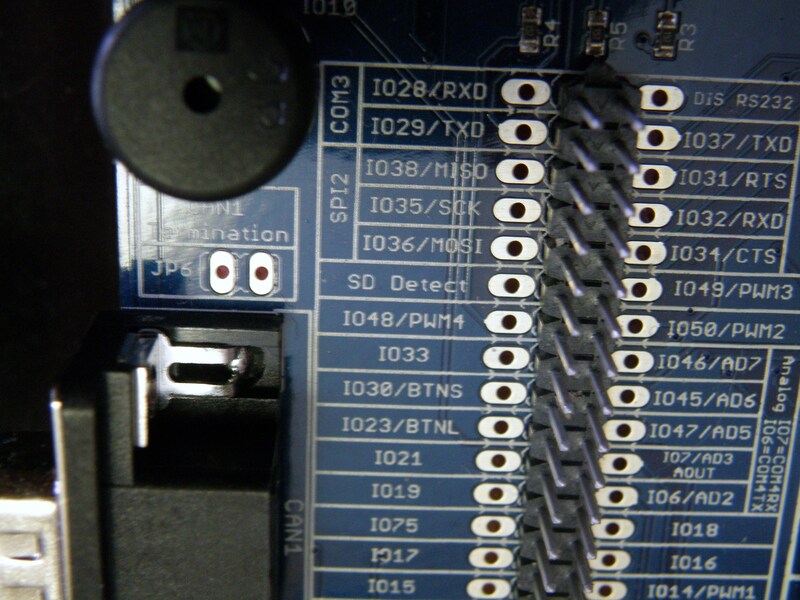 The sixth pin down from the top is labeled SD Detect and that line is tied to the switch in the SD card connector. By itself it doesn’t do anything, you have to tie that line to an input for the processor. I chose IO36 which is conveniently located right next door to the SD Detect line. You will need to run a jumper wire from SD Detect to whatever IO line you want to use. Be very careful! The data2 parameter is the state that the input is transitioning to. When the signal goes low then we know that the SD card has been inserted, we instantiate the PersistentStorage object and then mount the file system. The file system is not mounted by default. When the signal goes back high, we know that the SD card has been removed and we unmount the file system. You can compile and run the program now. You won’t see much of anything though. You can set a break point inside the interrupt handler and see that the input toggles high to low and back to high when you insert and remove an SD card. After the call to MountFileSystem add a call to GetFiles(). All we are doing is simply getting a list of files in the root of the SD card and then printing the file names to the output window. Now you can run the program on your development board and see the SD card doing something when you insert it. That is all there is to it.